In January I wrote about a study that traced a mutation in a single colon cancer gene to 1630. Today, researchers announced that a founder mutation in another gene, MSH2, has been traced to roughly 500 years ago (“Origins and Prevalence of the American Founder Mutation of MSH2” (pdf)). MSH2 is a mismatch repair gene, and mutations in the gene results in Lynch syndrome, also known as hereditary nonpolypsis colorectal cancer. Lynch syndrome accounts for 2.8% of all colon cancers in the Western world, with 4,500 cases a year in the U.S. One specific mutation in MSH2, the deletion of exons 1 through 6, was named the American Founder Mutation (AFM) and was identified in nine families. Previously, research had suggested that the mutation in the MSH2 gene had been brought to Pennsylvania by German immigrants in the early 1700â€™s. Upon further examination, researchers identified 32 new families who carried the AFM. Using extensive genealogical research that tracked the families as far back as the 18th century, 27 of the 41 AFM families were coalesced into seven extended pedigrees. These pedigrees are all available as WorldConnect databases. 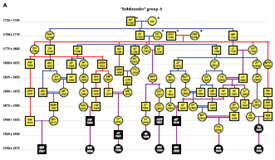 Unfortunately, the identification of 32 new families suggests that Lynch syndrome is far more prevalent than previously thought. Software used by the researchers predicted that this mutation arose about 500 years ago (with a 95% confidence interval of 425 to 625 years ago). Given that the seven extended pedigrees each had a common ancestor born between 1700 and the early 1800s, the researchers concluded that it was unlikely that there was a single common ancestor who arrived in the United States to link all the families. As a result, two hypotheses were asserted: either the AFM began with a common ancestor in Europe before the families emigrated to the New World, or, in light of the age of the mutation, it arose in a Native American population. Notably, despite efforts by the researchers, the specific MSH2 AFM has not yet been identified in Europe. This study is another example of researchers using genetics and extensive genealogy research to identify the origins of disease-causing mutations. These studies do more than just attempt to identify a founder, which might be considered just entertainment. Rather, this research identifies genetic relatives who might be candidates for genetic screening and allows scientists to estimate the prevalence of certain mutations. Additionally, this study in particular identified three states (Ohio, Kentucky, and Texas) where the AFM is more prevalent. Luckily, there are some measures that affected individuals can take to minimize the danger of the AFM. I replied to this story here. Key point is I believe there is zero evidence in favor of a “Native American” source for the mutation. n/a’s last blog post..Cherokee cancer gene? Not quite. Terrific post and a very in-depth analysis. I have more of a problem with the journalists picking up and concentrating on this minor point than I do with the authors for hypothesizing. I agree, it’s mostly on the journalists, and the researchers qualified their theories appropriately. Still, I think failing to check England as a potential source (or explain why they didn’t) was a major oversight.